Despite proven economic and health benefits, UK cycling gets a terrible deal when compared to other forms of transport. But don’t take my word – look at the statistics. The Netherlands spends £24 per head annually on cycling and Denmark spends £17 per head. By the Government’s own figures, spending on cycling infrastructure in the UK will fall from £95m (about £2.07 per head) in 2016/17 to just £33m (72p per head) in 2020/21. Even the most optimistic figures put UK spending at less than £5 per person. This reduction contrasts markedly with the £15.2bn allocated for capital spending on England’s roads. Key trunk road investment will rise from £1.83bn (or £40 per person) in 2016/17, to £3.86bn (about £84 per head) in 2020/21. According to Cycling UK the nationwide cycling investment figure is just 0.2% of the cost of the proposed HS2 railway line – even though research suggests that cycling and walking schemes have a massive cost to benefit ratio once health savings, pollution and energy use are considered. So while it’s a pleasant surprise to read about a new £23m investment to rejuvenate cycling and walking across the UK, even this amount is still very small change when compared to the £345 million plus being spent by the Dutch government. About £21m of the money will be used by Sustrans to improve significant stretches of the 16,000-mile National Cycle Network already identified in their ‘Paths for Everyone’ report. Sadly for Frome cyclists, none of this cash will be earmarked for our local routes in the town. 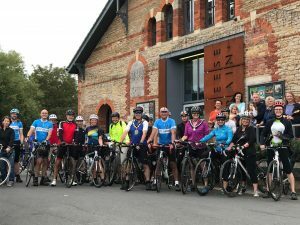 Meanwhile at Frome’s Missing Links AGM this week, volunteers pledged to continue raising money and making plans for better cycling facilities in the area with minimal funds. Once again, Frome volunteers pedal forward where others will hopefully one day follow.